This is a spiced tuberose fragrance. As there is an underlying air of freshness, I suspect that it probably features a note of white musk as well. Some who have tried this liken it to the Dior fragrance "Poison". This is a must-try if you are afficionado of vintage, 1980's-style perfumes such as Opium and Poison. 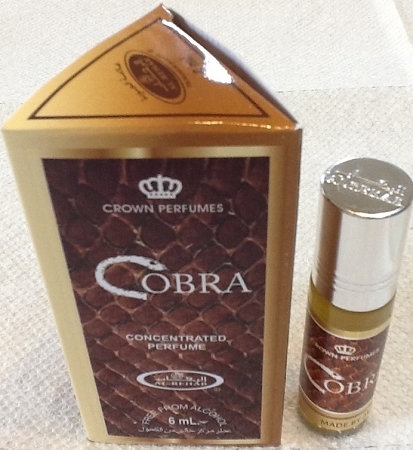 Much like the Arthes scent of the same name (now sadly discontinued) Cobra begins with a burst of aldehydes, flowing into a complex floral heart resting upon an oriental base of amber and myrrh. Long-lasting and admirable sillage. A+ attar. From looking at reviewers on YouTube, I had formed in my mind that this was going to be something like Drakkar but not exactly like it but somewhat have that vibe. This stuff is super strong. It's masculine at the top and then calms down to something floral. I'd heard one reviewer on YouTube say that it's a little too feminine but in my opinion it's not too feminine; that's why it's always good to try fragrances on your own skin rather than flowing off someone else's experience but anywho, I really like this stuff. I recommend any man to get there hands on this one.